Mr. Vegas is one of the most popular video slot games on the Internet that is powered by BetSoft casino gaming software. The 3D video slot machine opens up with a stellar introduction that gives an impeccable storyline of the game to the point where you can hear the theme song by Frank Sinatra that screams Las Vegas. Before you play Mr. Vegas online slots for real money you should know that this game features 5 reels with 30 paylines. There are great opportunities to grab big wins and the opportunity to win the progressive slots jackpot. The residents of the United States of America and Internet gamblers from all over the planet can play the Mr. Vegas video slots game for real money at any of the USA online casinos that are listed below or any of the USA Bitcoin casino sites. The introduction to this 3D video slot game that can be played for real money online and on mobile Smartphone’s and tablets is one of the best introductions we have ever seen. The 3D eye popping graphics that show a high roller living a great life with beautiful woman in a Las Vegas casino are immaculate. Once you spin the reels and begin to play ‘Mr. Vegas online slots for real money’ you will see symbols like beautiful women, a dice icon, the Mr. Vegas icon, roulette wheels, expensive champagne and other “Las Vegas casino” symbols. If you want to read other video slot reviews from BetSoft online casino gaming software take a look at the Paco and the Popping Peppers section. Before we tell you how to win the progressive slots jackpot playing Mr. Vegas we will tell you how to get free spins. 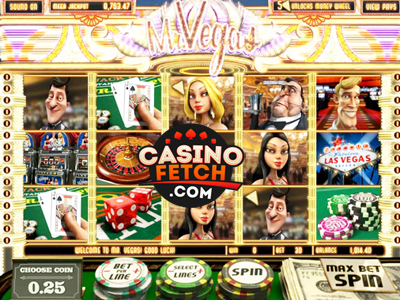 Land as many dice symbols on the reels as you can from the left hand side of your mobile Smartphone’s screen to the right hand side of your computer screen and also land a Mr. Vegas symbol on the reels at the same time on the first, second and third reels. This will bring the online gamers to the free spins bonus game where your winnings will be doubled by the value of the dice that you roll. While playing the Mr. Vegas 3D video slot game for real money online or on the go you can win more free spins during the bonus game. The way to win more of the freespins is to land the little slot machine symbol on the reels during the bonus round.